On the eve of the opening of the General Assembly session, Gov. Bob McDonnell announced Tuesday his plan for providing funds for transportation. Grabbing the headlines was the plan to eliminate the gas tax and replace it with an .8 cent increase in the sales tax. Both taxes are regressive, meaning they hit the folks at the lower end of the scale more than they do those at the upper end. 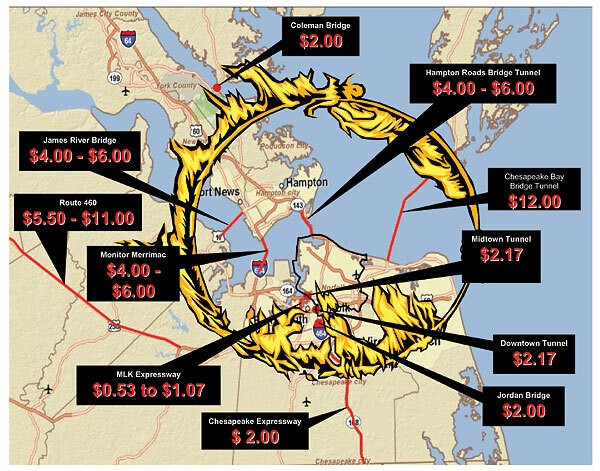 More than that, though, this completely decouples the idea of “user pays” from our transportation funding, part of the reason why tolls are becoming a way of life in Hampton Roads. There is no way to sugar-coat this: McDonnell’s transportation-funding package would be an unmitigated disaster. As it is, the governor has partially rolled back Kaine-era initiatives to coordinate transportation and land use planning, a prerequisite for creating a rational transportation system. Now, he proposes to obliterate the principle that those who use and benefit from the transportation system are the ones who should pay for it. Dedicate an additional .25 cent of the state’s portion of the existing SUT to transportation. I don’t think this goes anywhere. The General Assembly dedicated .5 cent of the sales & use tax to transportation when they raised the rate from 3 cents to 3.5 cents. They did nothing when they raised it to 4 cents, which was, of course, the time to do it. Increase vehicle registration fees by $15 and dedicate the revenue to intercity passenger rail and transit. I’m not fond of the idea, because these fees have gotten too high as it is. For me, this works out to be about a 30% increase. Impose a $100 annual Alternative Fuel Vehicle Fee and dedicate the revenues to transit. I’ll bet those driving alternative vehicles are not going to be happy to pay this. Adopt the Marketplace Equity Act now and dedicate projected revenues to transportation and education. This is the internet sales tax, passage of which in Congress is far from assured. Of course, if you buy stuff from out of state and don’t pay sales taxes, you’re supposed to report it on your state return and pay it then. Few people do. I’ll give McDonnell this: he’s offering something, even if it’s not the best plan. And he’s already taking hits from the “no taxes” crowd, including this Facebook page. But Virginia has gone far too long in not addressing our transportation needs. I wish McDonnell had introduced this plan when he first took office. Maybe we would have had something in place by now. As it stands, I’m not putting much faith in the ability of the General Assembly to pass much in this short session, as the 100-member House of Delegates eyes the November election. OK so maybe I am a little slow on this. But can someone explain this to me. If we pay a gas tax I know why people complain about hybrids as they are not paying as much tax. However, if we are paying a sales tax on everything and not a gas tax then why do hybrids have to pay more. Are they being penalized for buying hybrids. I must be missing something. It is a shell game that takes away the revenue stream that goes directly to transportation. I don’t trust the longevity of revenue that is initially mixed with general revenue. Blaming trucks for being big is idiotic. How about blaming VDOT for poorly designed and constructed roads. Hitler was able to build roads that are in use after 60 years. If uranium mining and/or a penalty for driving a hybrid are pushed through, I will seek residence elsewhere.